Industrial metals broke higher through an important five-year downtrend line as of 7th July 2017 and is solidly within a significant uptrend. Copper has been one of the driving forces with futures trading on the Comex market raced higher as global supply disruptions come back into view and large-scale speculators place huge bets on rising prices. Formerly known as Dow Jones-UBS Industrial Metals Subindex (DJUBSIN), the index is composed of futures contracts on aluminium, copper, nickel and zinc. It reflects the return of underlying commodity futures price movements only. It is quoted in USD. So why am I concentrating on this particular index and metals group? 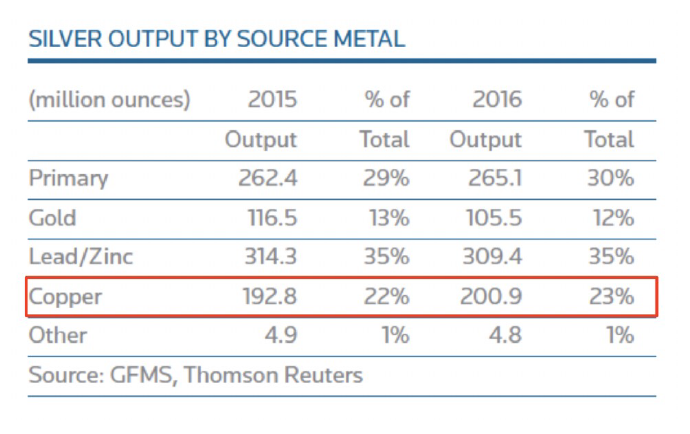 Quite simply, apart from 30% of silver production coming from primary mining and 12% from gold mining, near 57% of silver production comes from the bi-product mining of Lead, Zinc and Copper. This index has surged +65.6 % since its lows on 15th January 2016 of 84.5825, presently trading at 134.31 or +58.8% from January lows. 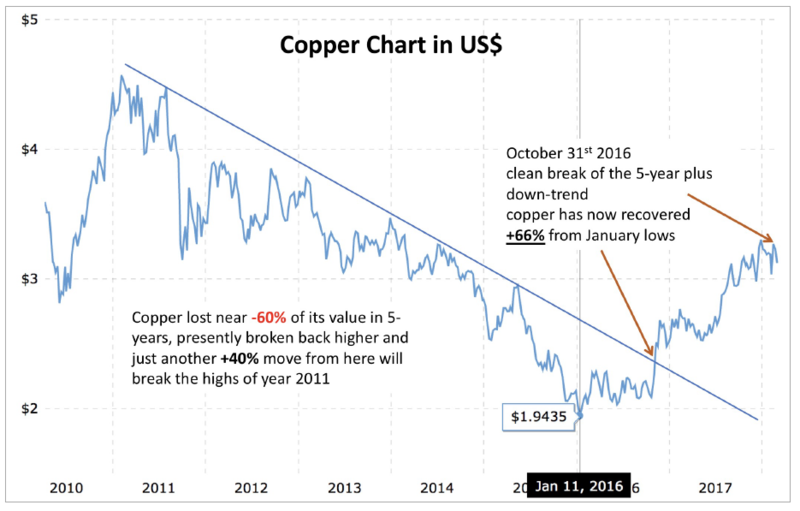 Copper’s 2018 year to date gains in percentage terms now top +25% and the red metal has recovered +66% in value after falling to six-year lows below $2.00 a pound in January 2016. So how well has silver done since its January 2016 low, as of today US$ 16.57 it’s trading at only + 21 %. So why do silver investors care what copper or the industrial metals are doing? Well just as a little reminder…. As we can see, the world produces over 700 times more copper than silver. 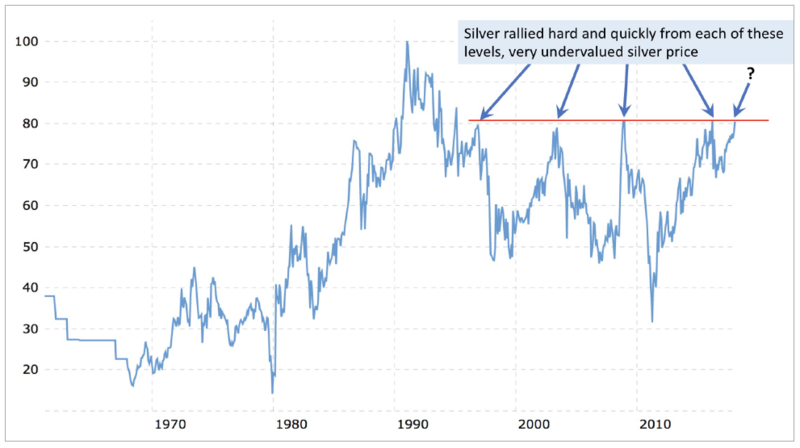 The premise that the price of gold and silver should be based upon their production ratio of 8.5 to 1, is not currently true as the price ratio is closer to 80 to 1 … nearly nine times higher. Well, let’s have a look at what the price ratio’s are telling us? The price of copper as 5th March 2018 is 3.122 US$ per Ib, to covert this to grams you have to divide by 453.5923 (Avoir-Pounds) and then multiply by 31.1035 to derive the price per oz which is 0.21415. Over 9 times undervalued compared to global production levels! In fact, the low in 2008 of Silver on 16th October after the enormous capitulation of silver before the 500% plus move into 2011, saw a low of US$ 9 and a price of 1.6750 Ib in copper on the same day. Gold / Copper price ratio matches the mine production ratio near spot on. Silver / Copper price ratio effectively under-values silver by over 900% compared to mine production. 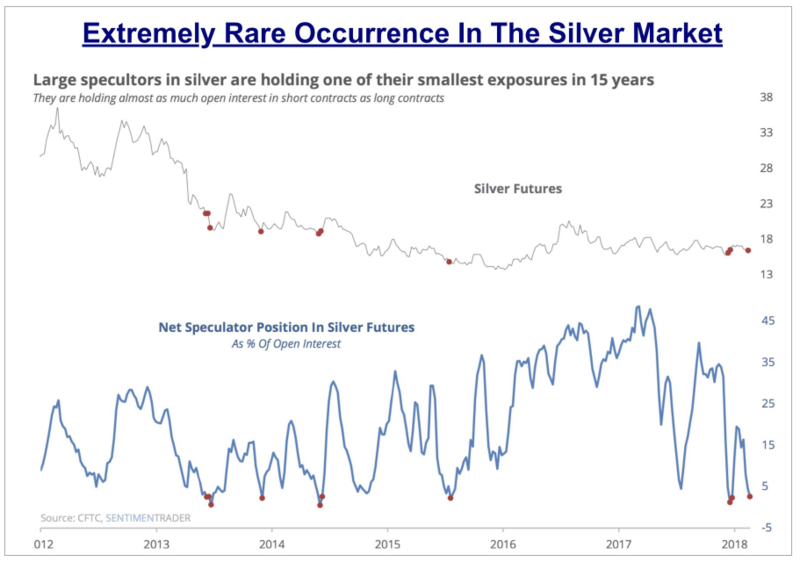 The enormous near -60% capitulation of silver in 2008 before the enormous revaluation higher in 2011 saw a low of the Silver / Copper ratio of 78.36 and today’s it’s 77!!! 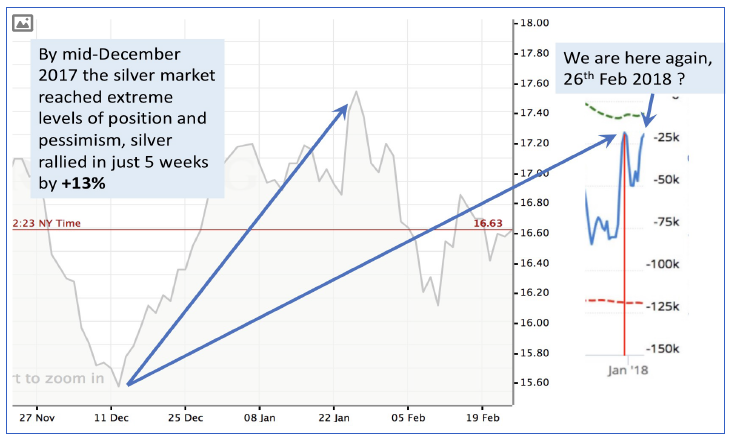 The key industrial metals all involved in the bi-product production of silver have broken a significant long-term downtrend and have made significant moves higher, silver is a vital strategic industrial metal – this cannot be ignored and clearly gives us lead indicators. It does not get much better than this as a long-term buying opportunity. 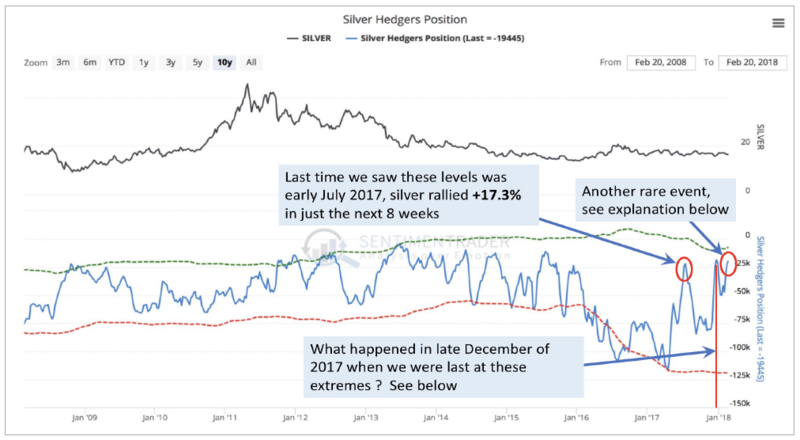 But historically silver is presenting a number of seriously undervalued messages, a longer-term stance and recognition of this opportunity is merited and deserved. 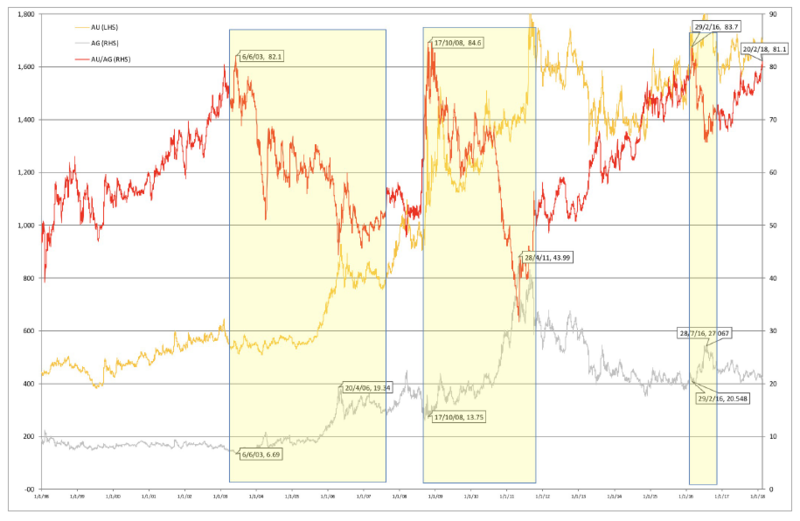 So in the three yellow boxes above, each time Silver reached this important level of approximately 81 to 1 price ratio of gold to silver. companies. 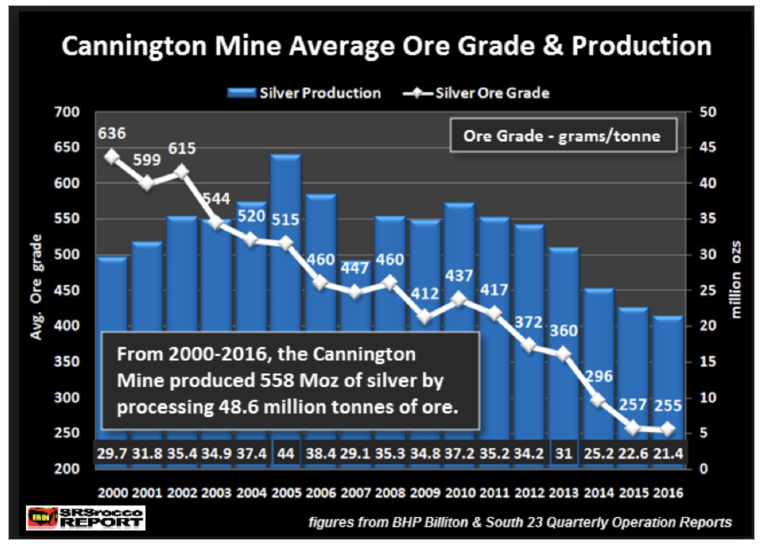 Investors who believe it still only costs $5 an ounce to produce silver, as it did in 1999, fail to grasp what is actually taking place in the silver mining industry, with full primary mine silver production closer to 17 US$ levels. 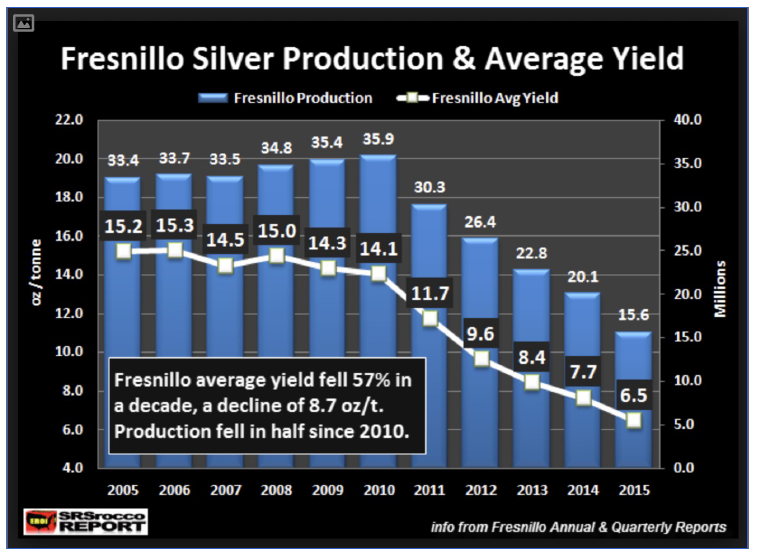 Fresnillo… – ore grade degradation of 15.2 oz per tonne to presently 6.5 oz, a – 58% fall in ore grades with an obviously massive increase in cost production. 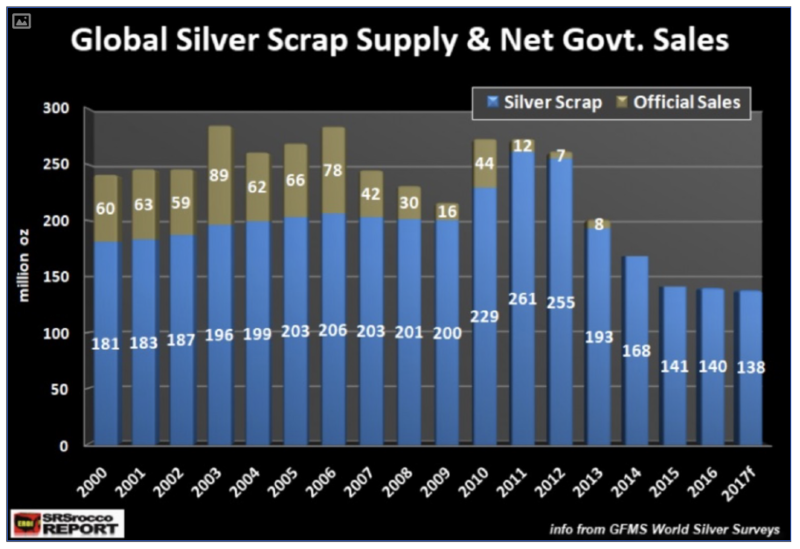 Scrap silver sales globally have fallen dramatically from the highs of year 2011 and 2012, but more importantly is -30% lower than in the early part of the millennium years when silver was trading around 5 US$, today it’s 17 US$ and yet silver scrap supply has fallen dramatically. Cycle analysis is pointing very clearly to the GSR (Gold/Silver Ratio) dropping to below 30 over the next few years, mix that with 17 years of consecutive global yearly supply / demand deficits in silver (which net government sales have filled the gap the deficit gap previously, but not anymore) and the fact that â€˜realâ€™ mine production is running a global Gold Silver Ratio of just below 8 to 1, and of course the fact silver cost production is rising very quickly. Well you get the picture! Yes, gold is going to appreciate dramatically over the next few years driven by the global debt crisis and counterparty liability crisis, but platinum and silver are clearly looking to outperform percentage wise any gold moves. Silver is also one of the few elements that improve the efficiency of chemical reactions. It is the only catalyst that will oxidize ethylene gas into ethylene oxide, the building block for polyester textiles used for clothing and speciality fabrics, and melded items like computer keyboards, electrical control knobs, domestic appliance components and Mylar tape used for all audio, VCR and recording tapes. Nanotechnology applications using silver are growing — in computers, communications, miniature motors and switches. The ease of electrodeposition of silver accounts for silver’s widespread use in coating. The plating thickness of some items, such as fuse caps, is less than one micron although the silver then tarnishes more easily. Coatings of two to seven microns are normal for heavy-duty electrical equipment. Silver plating is used in a wide variety of applications from Christmas Tree ornaments to cutlery and hollowware. Although a wide variety of other technology is available, silver-based photography will retain its pre-eminence due to its superior definition and low cost. From its very outset, silver halide has been the material that records what is to be seen in the photograph. As little as 4 photons of light activate silver halides which amplify that incident light by a factor of one billion times. In today’s photography, silver halides are coupled with dyes that bring the colour of the world around us into a permanent record. An estimated 196 million troy ounces of silver were used worldwide in 2003 for photographic purpose. Silver possesses working qualities similar to gold but enjoys greater reflectivity and can achieve the most brilliant polish of any metal. To make it durable for jewellery, however, pure silver (999 fineness) is often alloyed with small quantities of copper. In many countries, Sterling Silver (92.5% silver, 7.5%copper) is the standard for silverware and has been since the 14th century. Silver’s unique optical reflectivity, and its property of being virtually 100% reflective after polishing allows it to be used both in mirrors and in coatings for glass, cellophane or metals. Everyone is accustomed to silvered mirrors. What is new is invisible silver, a transparent coating of silver on double pane thermal windows. This coating not only rejects the hot summer sun, but also reflects inward internal house heat. A new double layer of silver on glass marketed as “low E squared” is sweeping the window market as it reflects away almost 95% of the hot rays of the sun, creating a new level of household energy savings. Over 250 million square feet of silver- coated glass is used for domestic windows in the U.S. yearly and much more for silver coated polyester sheet for retrofitting windows. Silver paste is used in 90 percent of all crystalline silicon photovoltaic cells, which are the most common solar cell, according to the Photovoltaic Technology Division of the U.S. Department of Energy. And all silicon cells used in space to power satellites use silver in the form of evaporated metal to make the electrical contact. The electricity generated by photovoltaic cells is highly reliable. As soon as sunlight strikes, power begins to flow. Sunlight striking silicon cells generates electrons, which the silver conductors collect to become a useful electric current. The conductive silver, which also enhances reflection of the sunlight, is applied in the form of a glass paste with a minimum of 90 percent silver along the top and across the bottom of the silicon crystal. When fired, the silver forms a complete circuit collecting solar energy and conducting it to the power supply line. A group of roofing-tile solar cells can generate sufficient power to provide a house and also fill batteries to supply power after dark. Silver plays yet another role in the collection of solar energy: an efficient reflection of solar heat. Silver is the best reflector of thermal energy (after gold). An increasing trend is the millions of on-the-counter and under-the-counter water purifiers that are sold each year in the United States to rid drinking water of bacteria, chlorine, trihalomethanes, lead, particulates, and odour. Here silver is used to prevent the buildup of bacteria and algae in the filters. Of the billions of dollars spent yearly in the U.S. for drinking water purification systems, over half make advantageous use of the bactericidal properties of silver. New research has shown that the catalytic action of silver, in concert with oxygen, provides a powerful sanitizer, virtually eliminating the need for the use of corrosive chlorine. GENERAL ADVICE WARNING – The information contained in this report is of a general nature only and you need to seek professional advice based upon your own personal circumstances before acting. Although we consider this material reliable, no warranty is given, and no liability is accepted for any statement or opinion or for any error or omission. IPM Group Pte Ltd. 30 Cecil Street, #19-08 Prudential Tower, Singapore, 049712, Company Registration No: 201428070N. All rights reserved. Any reproduction, copying, or redistribution, in whole or in part, is prohibited without written permission from the publisher. We are not tax advisers and we would always recommend you seek out independent tax advice. This guide is only meant to be used as an aid and an introduction to physical precious metals investment.